Summary: With all the power our mastery of the physical sciences has given us, we often forget that we remain subject to the whims of nature. Earthquakes, volcanoes, asteroids — and weather. Our recent obsession with climate change has blinded us to the ferocious impact of rare but normal weather patterns. Such as the second year of a La Nina about to hit the Pacific, creating ripples in the global economy. Also — Take a look at the BlogRoll. You might not have seen some of these website, and might find them valuable sources of insight and information. The nature and effects of even simple weather patterns can fill a book. Here’s a brief report about the effects of the La Nina about to hit the Pacific (the second year of this phase of the El Niño-Southern Oscillation, the ENSO). For several years people argued when I said that decadal weather cycles were a dominant form of climate activity, with effects far larger than the now century-long but very slow global warming. After last year I no longer hear such rebuttals. This year will we get another lesson for any remaining skeptics. Lack of time prevents an adequate report. Links at the end go to more detailed websites. Here is the chain of casuality. The computer models used by the National Weather Service forecast more bad weather in the Pacific. A La Nina, perhaps worse than last year. That means the probability (not certainty) of bad harvests in the Eastern Pacific region. Forcing food prices to rise in East Asia, again. Creating higher inflation in East Asia (food comprises 1/4 to 1/3 an average of 1/3 of emerging nations’ urban price baskets). That could mean bad news. 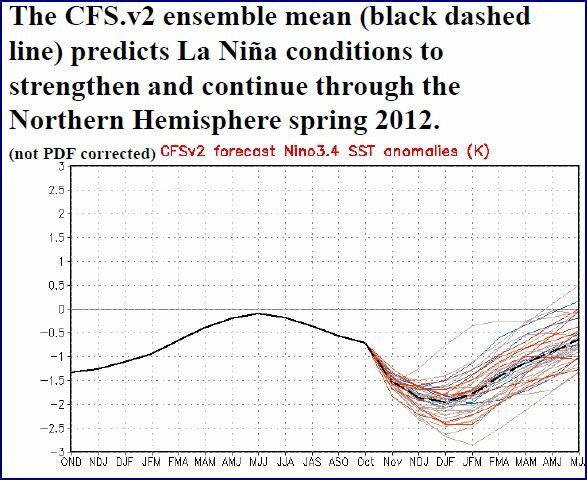 But current circumstances magnify La Nina’s effects. The Peoples Bank of China has been applying tight credit and tight money to fight too-high inflation. Spirits have lifted during the past two weeks on hints that the PBoC was slowly starting to ease. But rising inflation probably means no easing (or a long delay before easing). Update: China’s inflation, measured by the GDP deflator, was 10.3% in Q3. Asia was the only region which had good odds of fiscal stimulus and accelerating growth. Continued tight money means more slowing growth in China. So the global economic train may have no engine, with Japan, Europe, US, and Asia all in the doldrums. By the way, forecasts for the Atlantic look even worse. Stockpile peanut butter, as the drought in Texas and the Southeast might continue — or worsen. From the US National Weather Service’s weekly ENSO report, 17 October 2011. The graph shows the anomaly vs the average for 1971-2000. It forecast roughly -2.0 for the December 2011 February 2012 quarter. Last year the low of the 3-month average was -1.4 for the periods ending from November 2010 to January 2011. The anomaly tends to seasonally trough around December. Previous Post The Iranian Assassination caper was a complete success! Does the food crisis mean that the world is overpopulated like Ive been reading in so many articles on how “infinite growth” must be stopped or what have you? There have always been famines. So by that definition the world was always over-populated. Not just by humans, but by animals too — as they do have population booms and busts. As for the over-population and zero-population growth gigs, that’s yesterday’s problem (in a sense). Fertility is been dropping everywhere, and none know what the trough will be. Population will continue to increase to roughly 9.3 trillion billion in 2050. Unless stopped by one or more of the 4 horsemen. I find the forecasts difficult to imagine, and the ecological effects of 9 trillion billion people would be horrible. After that the long slide of population might begin. Your grand-children might worry about the population crash (perhaps already affecting many nations (eg, most rich nations, Russia, China). Although beneficial in many ways, it might have disruptive economic and geopolitical effects. Demographics is to some extent a “last man standing” race. The last cultures and ethnicities to boom might dominate the world. Trillion I think you mean billion. So there are limits to growth like the title of Richard Heinberg’s book says? Yes and no. There may be no limits to growth in the usual sense. We could devote ourselves to living like rats in a care, building a world like Trantor in Issac Asimov’s Foundation series — of 45 trillion people (5000x the estimated peak population, circa 2050; see note below). Getting there would be difficult and painful. But it is physically possible, over time. But who care? The question is what we want to do, and what we will do. In fact we will almost certainly allow each nation to set its own policies (or no policy), and suffer the consequences if the four horsemen ride by. That some nations allow their population to exceed what can survive worse-case senators (eg, famine, flood) does not mean that there is a limit to growth in the sense the doomsters crow about. It means that at any given time and place there are limits, a very different thing. In the Foundation novels Asimov said Trantor’s population was 40 billion. But that does not match the description of a planet built-out as an entire city — with no farms or even open land, built down into the crust. Also, to be pedantic, I used the wrong analogy. Trantor survives with food imports from other planets. The massive cities described in Caves of Steel are a better analogy of getting to Earth’s maximum carrying capacity. The planet Gideon in the Star Trek episode “The Mark of Gideon” — season 3 of the original series, first broadcast on 17 January 1969. This comment was expanded from its original version. That could be taken as conflating the ideas of Donella Matthews with those of Richard C. Duncan. Not one a doomster make does understanding the potential application of systems dynamics at a planetary level . . . if we’re talking in Yoda’s idiom. Even if there are no theoretical limits on overall growth (however that’s defined – let’s stick with GDP, population, food and drinking water), it is possible for the rates of growth of key parts of the system to overwhelm the ability of other critical part of the system to grow fast enough to support them. The outcome can be likened to the ‘ripple braking effect’ that eventually halts traffic on an overcrowded section of highway even though there is no actual obstruction. It can be argued (and is by the UK’s New Economics Foundation among others) that the conditions now exist – brought about primarily by declining *net* energy flows – for a prolonged period of negative GDP growth at a global level, together with much-increased propensity for chaotic behaviours throughout the system – one result being, as you point out, diminished resilience in the face of visits from passing apocalyptic horsemen. Nicely expressed. Growth has never been well-planned, and very seldom been planned. it just happens, so that changes in the environment (eg, migration, weather, disease) result in populaton reductions. Usually by death. Again, very precisely and clearly stated. For example, look at oil — if production peaks soon, with short plateau followed by a rapid (eg, 5%) decline rate. Bad for global gdp. As for “chaotic behavior”, the global economic and political regime may be fundamentally changing. We had the long peace from 1815 – 1914, but the transitional period of 1914-1950 was horrible. Lots of chaotic behavior. Nothing is written, so we may avoid bad outcomes. But we must prepare for the possibility of such scenarios. I have expanded my reply to your original comment (above).